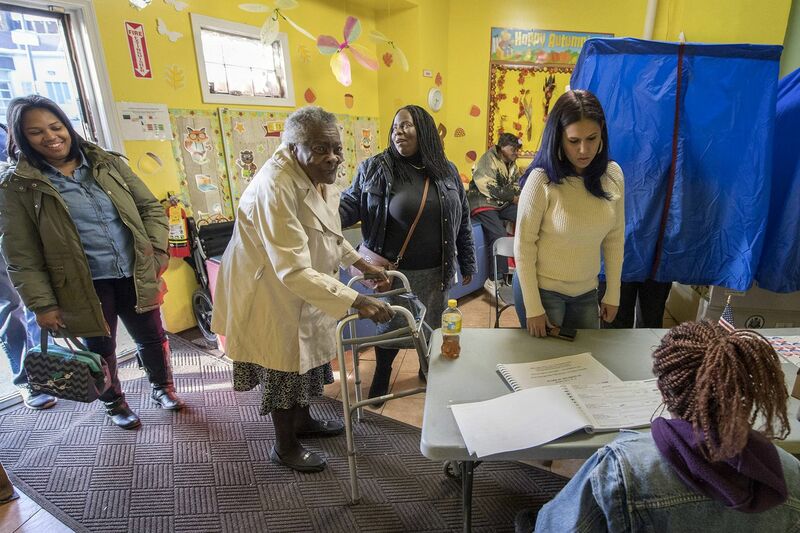 88 year old Mary Holloway waits with her daughter Brenda Jeffries to vote at her polling place on North Broad Street near Elser Street in North Philadelphia in 2016. Less than seven months after the November midterm, Philadelphia voters will be back at the polls May 21 to cast their ballots in, yes, another election: the Pennsylvania primary. The vote’s an important one, too, as Philadelphians will vote on the council members, mayor, sheriff, city commissioners, and judges making decisions in their daily lives. Here are the dates you’ll want to mark in your calendar and what to expect when you get to your polling place. What are the primary elections? When are they? Primary elections are held so voters can select nominees in each party, who will then face off in the general election in the fall. This year in Philadelphia, voters will decide on the mayor, city council, county sheriff, register of wills, and judges amid a crowded pool of candidates. Voters in the suburbs will cast ballots to select party nominees for county offices, municipal positions, and judges. The 2019 general election will be held Nov. 5. Where do I vote? What are my polling place’s hours? Polling places can change, so be sure to check where you’re going ahead of time. Pennsylvania polling places are open from 7 a.m. until 8 p.m. Go to the Department of State’s website to find your polling place. Does it matter whether I’m affiliated with a party? Yes. Pennsylvania is a closed primary state, meaning you can only vote under the party you affiliated with when you registered to vote. All voters, including those not affiliated with a party, can weigh in on ballot measures. In November’s general election, however, all voters will be able to cast ballots, regardless of party affiliation. None of this will matter if you’re not registered. April 22 is the deadline to register to vote in the Pennsylvania primary. Can I vote absentee in the primary? Yes. Voters have until May 14 to apply for an absentee ballot. Absentee ballots are due May 17. Some Pennsylvania voters who live outside the country, however, have previously been blocked from accessing absentee ballots on the state’s website. If you’re an overseas voter and can’t access the site, contact the Pennsylvania Department of State’s Help Desk by calling 1-866-472-7873 or emailing STSVCSURE_Helpdesk@pa.gov. In Pennsylvania, you only have to show your ID if it’s your first time voting in a precinct. What do I do if I’m having problems at the polls? Campaign materials being handed out a little too close for comfort? Voting machine broken? You can report that. Voter intimidation, coercion, threats, and anything else that hinders a person from voting fairly is considered a civil rights violation of federal election law, according to the U.S. government’s explanation of voting and election laws. You can report problems through the Department of Justice’s election complaint report site or by contacting your state or local election office. In Pennsylvania, you can report election complaints to the Department of State through an online form or by phone at 1-877-VOTESPA. The Philadelphia City Commissioners has a list of go-to numbers to contact if you’re experiencing things like voter machine or polling place issues. Contact information for other election offices throughout Pennsylvania can be found through the Votes PA website. As a registered voter, you have rights protected under federal and state laws. When you walk into your polling place — or if you're mailing that ballot in — you are entitled to be able to make your decision free from harassment and intimidation, no matter your race, color, or creed. If you have a disability, you're entitled to fair access. Pennsylvania has a guide on its Votes PA website outlining all your rights as a voter, from language to disability issues. Pennsylvania polling places need at least one accessible voting system, according to Votes PA, but if that’s not the case, you are able to choose someone to come with you into the booth. Coming next week, The Inquirer and Daily News will have a guide to the primary election for Philadelphia voters, complete with who’s running in your district and the candidates’ stances on key issues. You can also view a sample ballot here. If you have a candidate in mind whose name doesn’t appear on your official ballot, choosing to write in the candidate’s name could be an option. Pennsylvania allows voters to name anyone as a write-in candidate — in fact, that’s pretty much how Phillip Garcia of Manayunk became an election overseer with a single write-in vote in November 2017. Former deputy city commissioner Tracey Gordon demonstrates how to cast a write-in vote in Philadelphia in the video below. Don’t see the answer to your question on the 2019 Philly primary election here? Ask it below. Bookmark our Elections page for the latest updates leading up to the May 21 primary.